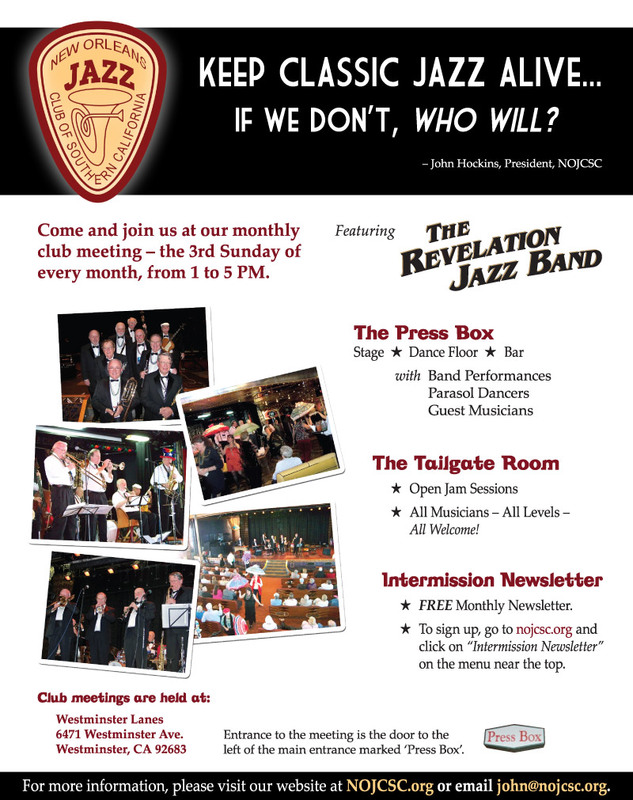 Join us at our next club meeting on Sunday, September 16, 2012 at the Press Box at Westminster Lanes (info below) for an entertaining afternoon of traditional jazz featuring the Revelation Classic Jazz Band and guest musicians! Pizza, Fruit & Salad Buffet included. South Bay New Orleans Jazz Club (1962–2012) cordially invite you to attend our 50th Anniversary Celebration on Sunday, September 9th, 1 to 5 PM at Knights of Columbus Hall, 214 Avenue "I", Redondo Beach, CA.